So far I only see the real violence coming from the left. On Saturday, Patriot Prayer rally in Portland, Oregon turned bloody after a far left communist of “Antifa” clashed with the Trump-supporting. 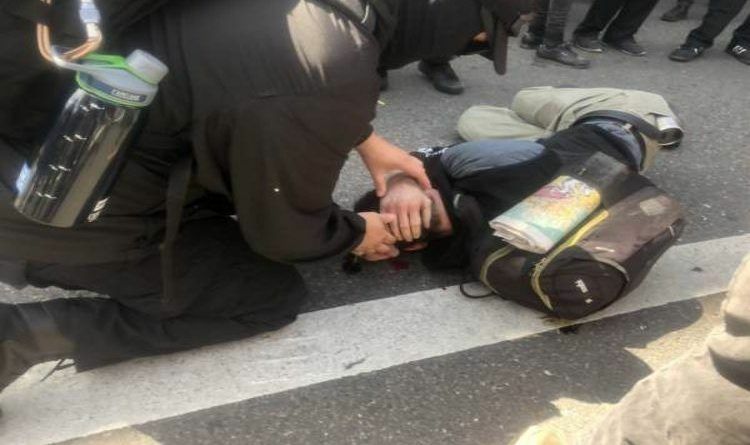 The conservative activist immediately lay down to the floor and was seen gushing from his head after an Antifa member clubbed him with a flag. “Man down. He’s dripping blood from his head. This is serious. He got in a struggle with some black-clad dudes over a flag and one of them clubbed him. Video coming,” reported Mike Bivins. The police told Antifa to leave without an arrest! Where is the justice?? They should all be arrested and charged as terrorists The police are protecting those thugs. I have had it with attacks on the voters and the citizens who love this President. It is more than an outrage for me. It is putting this nation and all those with voices in danger. Enough is enough. The time is long past for us to stand up and call the do-nothing Congress and or sleepy Session and take this nation back. Attacks on the innocent over and over again. We must contact our representatives and give them a piece of our minds. When are they going to start arresting these people? Maxine Waters all the Democrats who stood by while she made the comments have blood on their hands. Others have called for fighting Trump supporters. This man could die if he hasn’t already. Time to stand up. Apparently, CNN and other Fake News won’t report this. They are too busy criticizing President Trump.